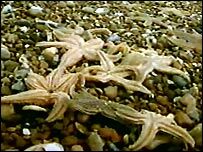 Thousands of dead starfish have been washed up on the coast of Kent between Pegwell Bay and Sandwich. The Environment Agency said the cause could be due to a lack of mussels on the seabed, and has ruled out any link to climate change or pollution. Spokesman Ian Humphries said: "As they get hungry they get more desperate... they take risks and come into shallow water where they're more vulnerable." He said they were not harmful and would probably be eaten by seagulls. Mr Humphries added that it was not uncommon for starfish to be washed up on the shore.